Following her semifinal win, Serena Williams admitted that Samantha Stosur, the tenth seed, would be a tough task in the final. While Williams’ words were proven true early on, she still found the means to neutralize her adversary. Williams prevailed 6-4, 6-2 over Stosur for her second Rogers Cup Trophy. For Stosur, the 2010 French Open finalist Stosur, it’s been a difficult year. Finally though, in Toronto, Stosur has been able to string together good performances putting down Na Li in the third round and Agniezska Radwanska, the titlist last week in Carlsbad, in the semifinals. Although at their ultimate meeting, the 2010 French Open, Stosur saved match point in defeating Williams in the quarterfinals. With a record of 2-8 in finals, Stosur would have to come up with something special to beat Williams who has a mark 38-14 at this stage of tournaments. In her third round match, Williams overcame dropping the first set against Jie Zheng and did the same in the quarterfinals in battling lefty Lucie Safarova. 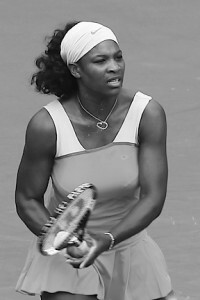 Yet, in the semifinals, Williams dominated world number four, Victoria Azarenka. At first, Williams had no answer for Stosur’s hugest weapon, the kick serve. With an ace, Stosur sealed her second love game for 3-2. Later, by utilizing her second big asset, the forehand, Stosur connected on a down the line winner for game point. When Williams netted the return, Stosur went ahead 4-3. Williams was also coasting on her service games and forcing a myriad of errors from Stosur. With no indication of an upcoming break point, the tide suddenly shifted with Stosur serving at 4 all and 40-15. Williams pulverized a second serve forehand return winner which stunned Stosur. The Aussie’s subsequent first serve was hit with less power resulting ultimately in a backhand mistake by Stosur and deuce. For the most part, the first week at Wimbledon has gone according to plan on the ladies’ side. As a result, defending champion Serena Williams will square off in the round of 16 against the woman who beat her in the 2004 final, Maria Sharapova. Similarly, the projected clash between Justine Henin and Kim Clijsters has come to fruition. This means that tomorrow, two individuals will be disappointed. Let’s analyze how we arrived at this point and what lies ahead in the second week. Top seed Serena Williams has simply run through her opponents. Likewise, Sharapova has had little difficulty getting to this stage, sending her adversaries home in straight sets. Serena and Sharapova have played seven times with the former winning five of those meetings. Curiously, since the 2004 championship, the two have never battled on grass. In essence, this will be their rematch. A significant factor will be how well Sharapova serves. If the Russian does well in that department, Serena could be in trouble. Na Li and Agniezska Radwanska who face each other in the fourth round have yet to drop a set in getting this far. Radwanska holds a 2-1 record against Li and both victories have been on grass. But for both Li and Radwanska, the quarterfinals will be a tough ask with either Sharapova or Serena as a rival. A definite stunner was the dismissal of French Open finalist Samantha Stosur in the first round by Kaia Kanepi. Previously ranked as high as 18 in 2009, Kanepi’s placement dipped to 80. After ousting another seed Alexandra Dulgheru in the third round, the talented Estonian is in the round of 16 . Another surprise is Kanepi’s opponent in the fourth round, Klara Zakopalova. The 28 year old had not gone pass the third round at a major previously. Zakopalova advanced by bouncing 18th seed Aravane Rezai in the second round and trouncing 10th seed Flavia Pennetta in the third. Caroline Wozniacki, the third seed, has been splendid on grass as she attempts to better her fourth round result from last year. Jie Zheng, the 23rd seed, and Victoria Azarenka, the 14th seed, fell victim to Petra Kvitova in the second and third round respectively. Thus, Wozniacki takes on Kvitova in the round of 16. The Dane carried their prior two matches. Furthermore, with Kanepi or Zakopalova as a quarterfinal match-up, Wozniacki truly has a green light to the semifinals. This was a disastrous week for the French Open winners. The reigning champion Francesca Schiavone went out in the first round. Last year’s title holder and 19th seed Svetlana Kuznetsova crashed out in the second round. Ana Ivanovic, the 2008 victor, bowed out in the first round. Hence, Ivanovic’s ranking of 45 will continue to head toward the cellar. Last year at the Polstat Warsaw Open, qualifier Alexandra Dulgheru, ranked 201st, beat Alona Bondarenko in the finals. As a result, Dulgheru became the lowest ranked player to prevail at this renamed event whose roll call of distinguished winners includes Justine Henin, Kim Clijsters and Venus Williams. Again, this year, Dulgheru, now world number 32, clashed with a seasoned competitor, Zheng Jie. The 20 year old triumphed over Zheng Jie 6-3,6-4 to obtain her second WTA title. After Zheng had no problem her first two games, she faced triple break point when Dulgheru fabricated a forehand dropshot winner. Once Zheng’s forehand crosscourt landed out of play, Dulgheru took a 3-2 lead. Despite a difficult game, Dulgheru consolidated for 4-2. Later, with a backhand down the line pass for a winner, Dulgheru captured a second break extending her advantage to 5-2. Serving for the first set, Dulgheru double faulted on triple break point, reducing her lead to 5-3. However, with a forehand up the line winner, Dulgheru had her fourth break/set point. By crushing another forehand up the line, Dulgheru broke for the third time to secure the set. Subsequent to a tough hold to open the second set, Dulgheru arrived at break point with a forehand crosscourt winner. An error on the forehand crosscourt by Zheng allowed Dulgheru to seize a 2-0 edge. Yet, with three consecutive mistakes, Dulgheru gave Zheng triple break point. The Chinese woman got back on serve with a lob winner. Soon, with a couple of timely winners, Zheng had triple break point. When Dulgheru donated a double fault, Zheng captured the break for 3-2. Promptly, Zheng consolidated for a 4-2 edge. After Dulgheru held another hard fought game, she teased three straight miscues out of Zheng for triple break point. By Zheng netting a backhand, the players were leveled at 4 a piece. Then, by connecting with a forehand crosscourt winner, Dulgheru went in front 5-4. With Zheng serving and ahead 40-15, Dulgheru produced a backhand winner and provoked an error to reach deuce. After Zheng erased an initial break point, a miscue on a swing volley handed Dulgheru her second championship point. Dulgheru sealed the victory with a backhand crosscourt winner. Still, for Zheng, it has been a terrific tournament, reaching her first final since 2006. Consequently, Zheng, the fifth seed and 25th ranked, will see a minuscule bump in her ranking. Caroline Wozniacki, the number one seed, retired with an ankle problem after dropping the first set to Zheng in the semifinals. While Elena Dementieva, the second seed, was booted out in the second round by qualifier Tsvetana Pironkova, third seed Li Na was bounced by Dulgheru in the semifinals and fourth seed Marion Bartoli in the first round. Qualifier Greta Arn took out sixth seed and 2009 finalist Bondarenko in the quarterfinals, thereby continuing the alarming trend of top players falling this clay season. 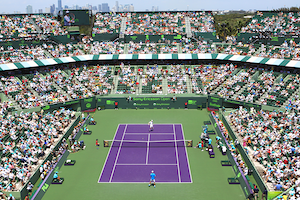 The men play today at the Sony Ericsson Open for a spot in the finals. Moreover, both the afternoon and evening sessions have doubles semifinals. In the first semifinal of the day, Andy Roddick battles Rafael Nadal. Although Nadal has a 5-2 lead in their series, on hardcourt their record is tied. Tonight in the second semifinal, Robin Soderling and Tomas Berdych play for a berth in the finals. Soderling leads that match-up 4-2. Chang. The last match of the day features 4th seed Rennae Stubbs and Lisa Raymond versus Gisela Dulko and Flavia Pennetta. Whilst rain had been forecasted in Miami at the Sony Ericsson Open on Friday, what was unexpected was Novak Djokovic’s second round departure. Olivier Rochus ousted the world number two 6-2,6-7,6-4. Simultaneously on court 1, Caroline Wozniacki, the women’s number two, was on the verge of an early exit herself. However, Wozniacki survived against Tsvetana Pironkova 3-6,6-3,6-4. Rochus broke in the opening game. After consolidating, Olivier placed a beautiful backhand down the line winner to set up triple break point. Rochus converted a second break when Djokovic’s backhand sailed long. After erasing a break point and extending his lead to 5-1, Rochus closed out the set his next time out. In the second set, Rochus again obtained triple break point and with a backhand down the line winner took a 3-2 lead. But, Djokovic got back on even terms promptly breaking the next game. The set went to a tiebreaker where Rochus got ahead early on. Yet, Djokovic weathered the storm and stole the set. The decisive set, after holding serve, Rochus was gifted a double fault by Djokovic and broke for 2-1. Then, by donating to his opponent a couple of errors, Rochus lost his edge. Soon though, Rochus worked his way to double break point and capitalized when Djokovic’s forehand traveled long. Later on, Rochus fought off a break point and stretched his advantage to 4-1. After failing to secure the insurance break, serving at 5-3, Rochus committed a string of errors allowing Djokovic to stay in the match. Still, with miscues by Djokovic, Rochus manufactured break point/match point. Olivier pocketed the match when another Novak forehand went astray. Q. Were you having problems breathing on the court? Looked like the conditions were a little bit heavy out there. DJOKOVIC: Yeah, it was a bit humid, but, you know, he was making me run a lot so points were really long. That was exhausting. Q. You’ve been playing a lot of tennis. Are you thinking of maybe rescheduling for the clay season? DJOKOVIC: I don’t know. I will have more time now I guess to rest and prepare well for clay. On to the ladies, after dropping the first set to Pironkova, Wozniacki was behind in the second set. The world number two battled back and captured the break for 5-3. Subsequently, Wozniacki held to push the match to a third set. In the ultimate set, Pironkova got a break early on and consolidated for 3-0. After finally getting on the board, Wozniacki earned triple break point and converted. Later at 3 all, Wozniacki took a go ahead break for 4-3. However, Pironkova fought back to 4 a piece. But, a resilient Wozniacki manufactured another break point and put herself in front 5-4 when Pironkova’s forehand up the line sailed long. Then, on her third match point, as a forehand from Pironkova landed wide, Wozniacki punched her ticket into the third round. With the rain backlog, Kim Clijsters’ match originally scheduled on stadium court was bounced to an outer court. Regardless, for Clijsters, it turned out to be a practice session with a 6-1,6-1 thumping of Petra Kvitova. Like Clijsters, Vera Zvonareva put on a clinic against Melanie Oudin 6-1, 6-2. Maria Kirilenko crawled out of a 5-2 deficit in the third set against Melinda Czink to pilfer the match in the tiebreaker. After losing the first set, Lucie Safarova seized the second set tiebreaker then rolled over Maria Jose Martinez Sanchez 4-6.7-6,6-2. Anastasia Pavlyuchenkova, the 22nd seed, continues to impress; the youngster beat Tamira Paszek 7-6,4-6,6-3 for a third round berth. Before the rain came, Victoria Azarenka, the defending champion, had a 6-3,6-2 victory over Alexandra Dulgheru. Jelena Jankovic, Dominika Cibulkova, Elena Vesnina and Shahar Peer were straight sets winners. Samatha Stosur was pushed to a third set by Carla Suarez Navarro and made it through. Elena Dementieva, the 5th seed, suffered her 11th defeat to Justine Henin 6-3,6-2. Alisa Kleybanova, the 24th seed, fell to Sara Errani 6-4,7-5 while Jie Zheng, seeded 20th, was upset by Virginie Razzano in straight sets. For Alize Cornet, it was another disappointing tournament with an early ousting, this time by Francesca Schiavone. Schiavone prevailed 6-3,6-2. After being on the road six weeks and some heartbreaking losses, Cornet’s 2010 record is now 6-9. Q. You look physically tired, are you also mentally tired? CORNET: Maybe a little, it’s already many weeks that I’m away from home. I have not cut back in terms of training and I am someone who trains a lot usually. I rarely give myself time off, days of rest. I am becoming cognizant that I should take resting a little more seriously and from time to time award myself a day off. However, I think it’s difficult with long stretches of tournaments as such. Djokovic was followed on stadium court by Rafael Nadal. In no time, Nadal dispatched Taylor Dent 6-4,6-3. Andy Roddick and Jo-Wilfried Tsonga had a no drama night with straight set wins over their opponents Igor Andreev and Guillermo Garcia-Lopez respectively. Ivan Ljubicic, the champion at Indian Wells last week, was forced to retire against Benjamin Becker after carrying the first set and the first game in the second due to a back injury. It was a tough day for the American males with Sam Querrey and James Blake going down after winning their first sets to Jeremy Chardy and Thomas Bellucci respectively. But, John Isner avoided the upset with a 7-6,2-6,7-6 victory over Michael Russell. David Nalbandian, Ivo Karlovic, Juan Carlos Ferrero, David Ferrer, Tommy Robredo, Nicolas Almagro and Phillip Kohlschreiber advanced. After eight days, the Australian Open field has been narrowed. Here’s a synopsis of the early round stumbles, near misses and a crack at determining a champion. Maria Kirilenko rocked Rod Laver Arena with a first day, first round, first match upset of 14th seed Maria Sharapova. With a suspect serve, will and grit could not pull Sharapova through her first competitive match of the season. Not resting on her laurels, Kirilenko progressed to the round of 16 where she received an early Easter gift from Dinara Safina. Nine games into the first set, Safina threw in the towel because of a back injury. As a result, Kirilenko reaches her initial major quarterfinal and will play Jie Zheng, the 2008 Wimbledon semifinalist. Zheng ousted 11th seed Marion Bartoli in the third round, then took care of Alona Bondarenko. Now, one of these women has the opportunity to advance to her first Aussie Open semifinal. Waiting in the wing for Kirilenko and Zheng is perhaps Justine Henin. The 2004 Australian champion had to work tirelessly to book a quarterfinal spot. Henin’s second round meeting with Elena Dementieva lived up to the hype with top-notch groundstrokes by both players. Upon surviving that encounter, Henin came close to saying cheerio in the third round. Alisa Kleybenova demanded Henin’s best before going down in three sets. A similar performance was required by Henin in the round of 16 with U.S. Open semifinalist Yanina Wickmayer proving a tough kill. Again, Henin needed to go the distance to seal the win and a date with Nadia Petrova in the quarters. Petrova was probably regarded as the Russian least likely to succeed at the start of the Open. However, after dismantling U.S. Open champ Kim Clijsters in the third round and ushering out French Open champ Svetlana Kuznetsova in round four, Petrova is no doubt a formidable adversary. Therefore, if Petrova continues along the same lines, Henin may be in for a colossal surprise. Defending champion Serena Williams has been impressive in marching to the round of 16. Serena has yet to drop serve nor a set. Her toughest test will be Aussie hopeful Sam Stosur in the upcoming round. With a big serve and a win over Serena in Stanford last year, Stosur has the tools to upstage the world number one. The U.S. Open draws have been posted with Rafael Nadal and Ana Ivanovic the top singles seeds on the men and women’s side respectively. Nadal should sail through to the quarterfinals where one possible tricky match up could be Argentine David Nalbandian. Despite a disappointing year, Nalbandian has always been dangerous on a hardcourt. Another David, countryman Ferrer who eliminated Rafa in the round of 16 last year may be a nuisance, although Nadal is not the same player. Yet, perhaps, the most dangerous potential opponent is Argentine Juan Martin Del Potro who has been blazing the last few weeks. If Del Potro continues to ride this wave, Nadal could be in trouble in the semifinals. Great Britain’s Andy Murray may have a lot to say in the matter, Del Potro and he could face off in the quarters. Czech Radek Stepanek who beat him at the ATP Masters in Rome could test second seed and defending champion Roger Federer in the third round. Moreover, Serbian Jarko Tipsaravic who almost defeated Federer in Australia could be a potential quarterfinal challenge. But another Serbian 2007 finalist Novak Djokovic may be Federer’s biggest obstacle as the two may end up clashing in the semifinals. Djokovic has been stumbling of late but his draw looks manageable particularly with a struggling Andy Roddick as a possible opponent in the quarterfinals. For Ivanovic, the task appears doable until the quarterfinals where she could meet Russian Dinara Safina who’s surely out for revenge after the French Open. Ivanovic’s thumb injury may be factor in the tournament. No possible Williams sisters finals, these two are on the same side of the draw and could clash in the quarterfinals. Moreover, both have intricate first round matches. Standing in the way of Serbian Jelena Jankovic could be China’s Jie Zheng in the third round or Russian Vera Zvonareva in the quarterfinals. The Russians are blessed with many contenders for the trophy. The road to the semifinals for Elena Dementieva and Svetlana Kuznetsova may mean motoring through one another. So it may not be a question of which country but which Russian will hoist the trophy, in my opinion, Safina has to be the favorite. Miami native Ahsha Rolle is a wildcard entrant. Click here to access all of the draws for the 2008 US Open. Spaniard Rafael Nadal continues to have the Midas touch. Nadal defeated Chilean Fernando Gonzalez in the gold medal round in straights sets 6-3, 7-6, 6-3. Gonzalez went up one notch in the hardware department by winning silver adding to the bronze he collected in Athens in 2004. Moreover, this was the cherry on top of Nadal’s flan as he officially assumes the number one ranking on Monday. In the semifinals, Gonzalez had a controversial match with American James Blake. 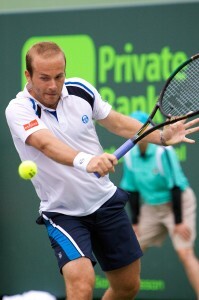 The dispute arose when a backhand pass struck by Blake inadvertently clipped Gonzalez’ racket. Despite the ball being initially on its way out, by default, Blake should have been awarded the point. But since the play was unnoticed by the umpire and Gonzalez failed to own up to his mistake, the Chilean was given the point. In his defense, Gonzalez stated that he was unsure that the ball hit his racket. Perhaps, Blake would have brushed off the incident had he converted on one of his three match points to advance to the gold metal round. After losing, Blake accused Gonzalez of poor sportsmanship, considering the arena this vitriolic statement is further magnified. In the bronze metal match, Blake fell to Serbian Novak Djokovic 6-3, 7-6. After going down to Blake in the quarterfinals, Roger Federer along with Swiss teammate Stanislas Wawrinka prevailed over top doubles seed Americans Mike and Bob Bryan in the semifinals. The Swiss went on to beat the Swedish team of Simon Aspelin and Thomas Johansson 6-3, 6-4, 6-7, 6-3 in the gold metal round. The Americans settled for the bronze metal, winning over the French team of Arnaud Clement and Michael Llodra 3-6, 6-3, 6-4. It was an all-Russian sweep in the women’s singles. Elena Dementieva beat Dinara Safina in an enthralling three setter 3-6, 7-5, 6-3. In the second set, after making up a 1-4 deficit, Safina had momentum on her side and the opportunity to take the lead at 5-5, but she failed to convert on break point. In a game Dinara was leading 40-15 Dementieva eventually broke. From then on, fatigue became a major factor for Safina. The bronze metal went to Vera Zvonareva who handled China’s Na Li 6-0, 7-5. After being dismissed in the singles quarterfinal, Serena and Venus Williams squashed the Spanish team of Anabel Medina Garrigues and Virginie Ruano Pascual 6-2, 6-0 to win doubles gold, the second for team Williams. In the consolation bronze metal match, Chinese Zi Yan and Jie Zheng beat Ukrainian sisters Alona and Kateryna Bondarenko 6-2, 6-2.